The perfect closure for a wide variety of diaper designs, as well as apparel and baby accessories. Tested and proven to be safe for baby. 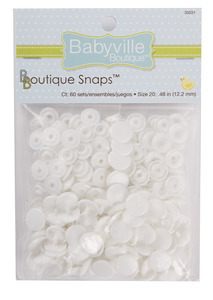 Package contains 60 snap sets, size 20, white. One set includes 2 caps, 1 stud and 1 socket.